Jazz is never going to die. Too many hip-hop producers sample jazz music for that to happen. But what to make of the modern-day jazz musician's place in a celebrity-obsessed music climate? Chances are, the days of a traditional jazz musician transcending the genre are long gone. In the past decade, the popularity of jazz has been in a steep decline. In 2000, according to the Recording Industry Association of America, jazz records accounted for 3 percent of all recording sales; by 2008 they accounted for only 1.1 percent. With the recent release of her sophomore CD, Chamber Music Society, it will be interesting to see if Spalding can deliver on the promise of her first effort. But even with all the mainstream appeal she's garnered in her still-fresh career, Spalding's new album is a sophisticated effort, with none of the flash to accompany the hype that surrounds her. She insists that this is how it should be. "We're musicians first," Spalding tells The Root. "There's a whole amazing team of businesspeople who can handle all the business stuff, figuring out the best way to promote." Thus far, Spalding's team has done a great job promoting the Portland, Ore., native. Not only is she being seen on the cover of niche magazines like jazz's monthly tome, DownBeat (she's on the cover of the September issue), but her team has also booked her for performances on mainstream shows like the Late Show With David Letterman and Jimmy Kimmel Live. Then again, this can also be attributed to Spalding herself. After all, she does have a look teeming with star appeal. From her youthful energy (she's only 25) to the big hair to the mega-watt smile, Spalding is a label marketer's dream. But it's not just her looks that attract the attention of companies like Banana Republic, which featured her in its spring-summer ad campaigns last year. There is, after all, something to be said for talent. It's difficult to pinpoint Spalding's tipping point. Her 2008 album, Esperanza, stayed on top of the Billboard jazz charts for more than 70 weeks. 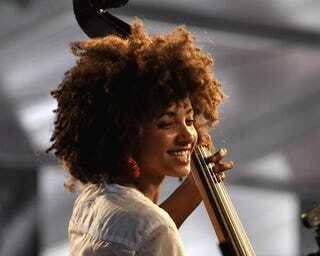 Esperanza won Spalding recognition from the likes of Questlove from the Roots, who invited her to perform at the first annual Roots Family Picnic as the lone jazz act on the bill. After she performed at last year's White House Poetry Jam, her name was on top of the Google Trends list, a tool used to measure the most popular search terms each day. This summer she was a featured performer at the BET Awards in a tribute to Prince. She also performed last year at President Obama's Nobel Prize acceptance speech. And yet, with all the buzz surrounding her, Chamber Music Society seems to acknowledge none of it, at least not in the form of an easily accessible album. The CD, as the title suggests, is a tribute to the classic music subgenre known as chamber music, something even jazz enthusiasts might find off-putting. But in Spalding's hands, along with those of her drummer, Terri Lyne Carrington, and pianist, Leo Genovese, the music sounds refreshingly modern. "Apple Blossom" is a beautiful, lush folk ballad featuring Spalding on vocals along with one of her musical mentors, the Brazilian singer Milton Nascimento. "Winter Sun" is an upbeat jazz burner, showcasing the in-pocket chemistry of her trio, and "Knowledge of Good and Evil" is the album's most mammoth track. Clocking in at nearly eight minutes, it's a song with movements, like a tightly wound suite that bends the genres of both jazz and classical. What is noticeably absent from Chamber Music Society is a record akin to the kind of music Spalding is more than capable of performing. The bassist's reworking of "If I Was Your Girlfriend" during her Prince tribute at the BET Awards was one of the show's highlights; when she performs live, it's not unusual for her to throw in a remake of a song like Michael Jackson's "I Can't Help It." Chamber Music Society has none of these songs — or any songs made for mass appeal. This is not to say that Chamber Music Society misses the mark, by any means, but when one considers the genre's dire straits, it wouldn't be a stretch to think one of its biggest stars might throw something more familiar to an audience that keeps on growing with every show and television appearance. Spalding sees her surging popularity differently. Just because her audience is probably more familiar with Motown than Monk doesn't mean she will cater to their ears. As an example, she points out "I Adore You," a song from Esperanza. "I remember having discussions, and [some would say,] 'It's too much scatting, it's too jazzy.' And now all the time, people say it's their little kids' favorite song," Spalding says. "And there are no words. Parts of it are complex, but aspects of it speak to their kids, too." And for Spalding, therein lies the challenge: to speak to audiences of all ages through a variety of genres. "Obviously, the audience that shows up to [Austria's] Vienna Opera House is going to be different than the audience that shows up to [New York's] Joe's Pub," says Spalding, who has played at both venues. "I guess I'm really blessed that it's very diverse, and it will be a blessing as long as I stay relevant."